Free directory app. 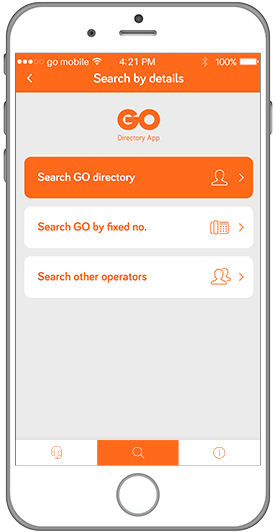 GO directory app is a free telephone directory application which includes all numbers of all registered phone and mobile telephony operators in Malta and Gozo including residential, business and Government numbers. Easy to use. You can search GO directory by details, GO fixed lines by numbers and other operators by details. Address book. Add to your address book in a few clicks directly within the app. Available with Android & iOS. Supported by Android version 4+, iOS version 8+. Download your app on your smartphone or tablet through the below buttons.